Mona B. Parker Dopp Kit | P.C. Fallon Co. The Parker Dopp Kit by Mona B. is constructed of rugged up-cycled canvas with leather trim. 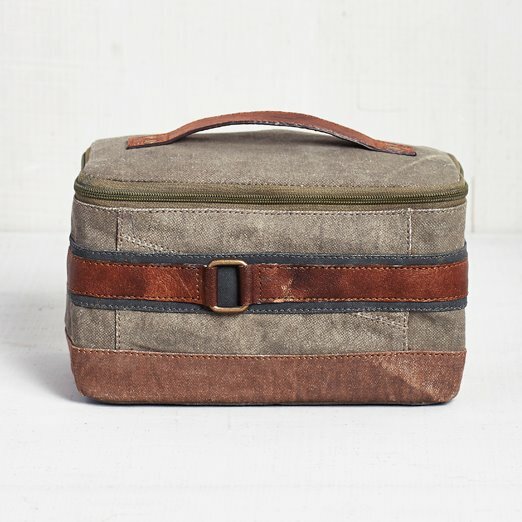 This handy toiletry case for men's grooming items is based on Dopp Kits which were issued to GIs during World War II. The canvas bag has a brown leather handle on the top and zips closed around the top. Interior is lined with grey polyester for easy care. There is a brown leather band around the middle with bronzed buckle accent. Base has brown canvas band. Very functional with a distinct look. Measures 10"W x 5H x 5.5"D. Made from up-cycled canvas. The fabric shows the history of its travels which may include stitch marks, minor staining and unique scars and bruises. Color variations and patches add to the uniqueness of each bag. Heavy cotton canvas.